The following is a simplified summary of recommendations for irrigating winegrapes with limited water supplies. The reader is strongly encouraged to download the following document, pdf document to gain more information on managing winegrape irrigations. "Appropriate irrigation scheduling" is an axiom whereby irrigations are scheduled to apply an optimum quantity of water that maximizes productivity. This often results in maintaining soil water content near field capacity. However, in the production of winegrapes, it has long been recognized that water deficits can lead to improved fruit quality-especially in red wine varieties. In recent years it became clear that maintenance of a moderate plant water deficit can improve the partitioning of carbohydrate to reproductive structures such as fruit and also control excessive vegetative growth (Chalmers, et al., 1981), giving rise to what has been termed by Chalmers et al. (1986) as 'regulated deficit irrigation' (RDI). Regulated deficit irrigation (RDI) is a term for the practice of regulating or restricting the application of irrigation water limiting the vine water use to below that of a fully watered vine. Achievement of successful RDI requires accurate soil moisture or plant 'stress' sensing, the ability to estimate crop water demand, and the ability to irrigate frequently. Regulated Deficit irrigation can be a component of a "standard" irrigation strategy or utilized in a "drought strategy" to curtail vine water use during periods of limited water availability. The timing and degree of vine water stress determines the effect on vine growth and fruit development. Moderating the severity of water deficits through stomatal closure works well initially, generally limiting the effects of water deficits to a reduction in vegetative growth. As water deficits increase in severity and duration, the stomatal openings are reduced for longer periods of time. Since the stomata are the entry points for atmospheric carbon dioxide gas used in photosynthesis, severe water deficits limit the time the stomata are fully open which in turn limits photosynthesis. The degree to which canopy and fruit growth are impacted depends on the severity of water deficit and vine growth stage. The rates of vegetative and fruit growth change over the course of the growing season (Figure 1). Shoot growth begins shortly after bud break and proceeds at a high rate so that nearly one-half the final shoot length is attained by flowering. Vegetative growth rate then declines to near zero as veraison, the onset of fruit ripening, is approached. 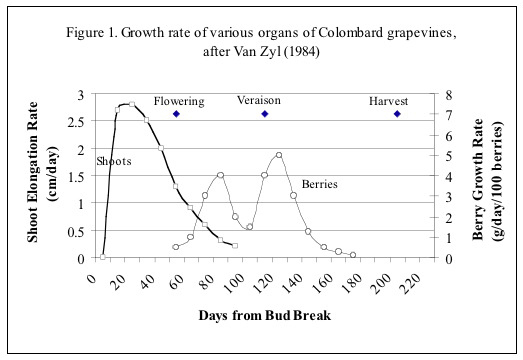 Berry growth rate can be described in three stages; Stage I, a rapid period of growth caused by cell division, Stage II, a much slower growth rate referred to as the lag phase and Stage III, a final rapid growth period caused by cell expansion beginning near veraison. At verasion, berries begin to soften, change color and accelerate in growth to attain maximum size during this third and last stage of growth (Stage III). Titratable acidity (TA) decreases and pH and soluble solids (Brix) increases. If water is abundant, lateral shoot growth can continue during this period. Under normal early-season conditions up through fruit set, water deficits are uncommon in most winegrowing regions of California because (1) water is readily available in the root zone, (2) the vine is not at full canopy expansion, and (3) the atmospheric-driven demand is small. This assumes a root zone of at least 24 inches. As the season progresses, the canopy expands, evaporative demand increases and without irrigation, the soil is further depleted of available water. At this time the vine's water demand can exceed water uptake from the soil causing water deficits. Regions with lower evaporative demand and a greater volume of available water in the soil from winter storage or irrigation will cause water deficits to be postponed to later in the season. Moderate water deficits at this time can control expansive vegetative growth while allowing photosynthesis to continue unabated. This is the basis for successful Regulated Deficit Irrigation strategy. Although canopy growth is not significant or has stopped, canopy size and climatic conditions drive water use at its maximum rate at this time. Even vineyards with the largest soil resource and cool climate will experience water deficits without irrigation. Moderate deficits are necessary during this period to deter the resumption of shoot growth. Depending on the RDI selected for this period, berry size can be significantly reduced when compared to a well watered vine. Recent research supports less severe water deficits during the last few weeks prior to harvest that will minimize crop reduction while still maintaining desired fruit characteristics. This is especially true when harvest timing is predicated on extended maturation. Severe deficits at this time can lead to a reduction in stored carbohydrate reserves and negatively affect shoot growth and cluster development the next season. Trunk and root growth is responsive to photosynthates produced after harvest. Post harvest root growth requires soil moisture for root expansion. If vines become defoliated a short time after harvest under certain conditions, shoot growth may occur if water is applied. Water deficits, both their amount and timing, affect vegetative growth, berry growth, fruit quality, titratable acidity / malic acid, phenolics, and yield. For detailed additional information, see pdf document. Deficit Irrigation is practiced to limit excessive vegetative growth and improve fruit quality or limit water use in times of drought. If neither of these conditions exist, alternative irrigation strategies may be more appropriate. Examples of the latter include young developing vineyards and low vigor vineyards whether it is from rootstock/scion selection for the soil resource or nutrition or pest related issues. When selecting an irrigation strategy it should be designed to accomplish a solution to a specific problem, executed, and then monitored to determine its effect. Adjustments can be made in succeeding years to move towards the desired effects. A strategy to control excessive vigor and open up the canopy to increase diffuse light to the fruit zone generally requires that no irrigation be applied until shoot growth has slowed as a result of reduced water availability in the root zone. Visual clues or leaf water potential measurements may be used to monitor vine water deficits to allow only a moderate level of stress to occur prior to the first irrigation. 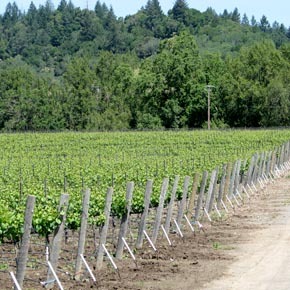 Moderate levels of vine water stress vary somewhat by variety and fruit quality goals. White winegrapes can benefit by reducing vegetative growth, however leaf loss allowing light into the canopy may create more color and character than desired. Red winegrapes on the other hand tend to benefit from more exposure and higher levels of stress. Mid-day leaf water potential of -10 to -13 bars is a typical irrigation start point for a RDI program white winegrapes. Red winegrapes develop desired fruit characteristics with a more severe midday leaf water potential of -13 to -15 bars. Varieties of red grapes differ in responsiveness to water stress. Merlot is most sensitive followed by Cabernet Sauvignon and Syrah. Within this group, Zinfandel is the most tolerant to water stress. Once a midday leaf water potential is selected as the irrigation start point (referred to as the "irrigation threshold" or simply "threshold" in this document) the question then becomes how much water to apply for a specific RDI. The RDI is a percentage of the full potential vine water use based on climatic demand and canopy size. The selected RDI should be low enough to prevent the resumption of shoot growth and high enough to continue photosynthesis, and prevent excessive leaf loss that could cause the fruit to be sunburned or raisined. 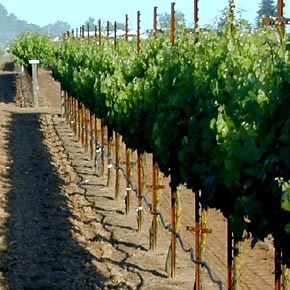 Successful RDI's are typically 50 to 60% of full vine water use. More severe RDI's of 35-40%, when sustained through the ripening period, have resulted in delayed maturity and poor quality fruit in seasons with weather conditions that also delay fruit maturity. For detailed information on implementing a RDI strategy, see pdf document. Young vines should be fully irrigated until the first bearing year to maximize root and above-ground growth. Vines in deep soil and high available water holding capacity soils located in a cool region, may not reach the predetermined RDI threshold by harvest or the threshold may be reached only after a sustained severe weather period. In these cases, the soil/water resource is too large for the environmental demand. The use of a cover crop to extract moisture might be appropriate to reduce the available soil water. In shallow soils or low water holding capacity soils a cover crop or resident vegetation may cause the threshold to be reached too early in the season causing water deficits in berry development (Stage I). Water deficits at this time will reduce fruit set and cause smaller berries, which will reduce yields. To avoid this situation, irrigation can delay the threshold until adequate shoot growth is attained. Rootstock differences seem to be insignificant for the RDI threshold selected; however, the rate at which the threshold is reached seems to be rootstock dependent. The more vigorous and root extensive rootstocks will be slower and more predictable in the increase in water stress as they approach the threshold. Less vigorous rootstocks and those that have a predominance of shallow roots will increase in water stress in a more rapid fashion, especially when climatic conditions are harsher. 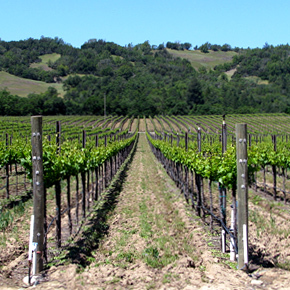 Extremely low vigor vineyards with barely sufficient leaf area to sustain vine growth and mature fruit are not appropriate candidates for the Regulated Deficit Method. 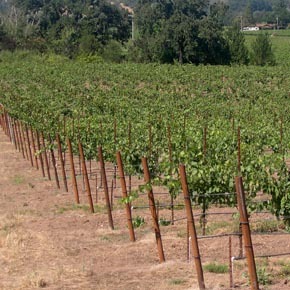 Reduced canopy growth in these vineyards may be due to a variety of causes including minimum available water holding capacity, disease or pests. In other low vigor sites, the effects of a RDI strategy yield and fruit maturity must be carefully monitored. In years with low amounts of stored soil water at bud break, irrigation may be needed prior to bloom to attain adequate shoot growth. However, when vine vigor provides adequate to more than adequate canopy to support the crop load, limiting water availability and restricting or controlling additional canopy (leaf area) is desirable. At sites with elevated soil salinity, deficit irrigation needs to be approached with some caution. High soil salinity adds an additional stress factor to the vineyard, and needs to be taken into account when restricting irrigation. The leaching requirement of such soils may also lead to the need for increased water applications outside of the normal vine growth period. Under severe climatic conditions, excessive fruit exposure can raise the berry temperature and prevent the accumulation of pigments, resulting in poor berry color. Enhancement of color pigments (anthocyanin) and flavor compounds (phenolics) is a consistent result of optimum light exposure. Water deficits can cause basal leaves to drop depending on severity. Leaf removal, mechanically or by hand, can open the canopy and supply additional light in the fruiting area. These practices are synergistic and care should be exercised when using both practices, especially in more extreme climatic region of California. Using a Regulated Deficit Irrigation strategy, whether in response to drought conditions or in the normal course of producing quality fruit, considerable water can be saved over full potential vine water use. Typical water savings using RDI varies by growing region from 28 to 57% (Table 1). Water use efficiency can be viewed from the perspective of the amount of grapes per unit of applied water consumed or the total water consumed. Total water consumed (ETc) includes soil water contribution, effective in season rainfall, and irrigation. Regardless which measure of water use efficiency used, full potential vine water use is the least efficient (Table 2). An increase in efficiency is possible using deficit irrigation. RDI level 3 (most severe) was the highest water use efficiency while the less severe RDI level 2 was intermediate. Chalmers. D.J., G. Burge, P.H. Jerie, P.D. Mitchell. 1986. The mechanism of regulation of Bartlett pear fruit and vegetative growth by irrigation withholding and regulated deficit irrigation. Journal of the American Society of Horticultural Science 111, 904-907. Chalmers, D.J., P.D. Mitchell, L. Vanheek. 1981. Control of peach tree growth and productivity by regulated water supply, tree density and summer pruning. Journal of the American Society of Horticultural Science 106, 307-312. Van Zyl, J.L. 1984. Response of colombar grapevines to irrigation as regards quality aspects and growth. South Afr. J. Enology and Viticulture 5:19-28.